It would seem that Facebook is on a kick to get as many businesses as possible involved in their new Facebook Places pages. 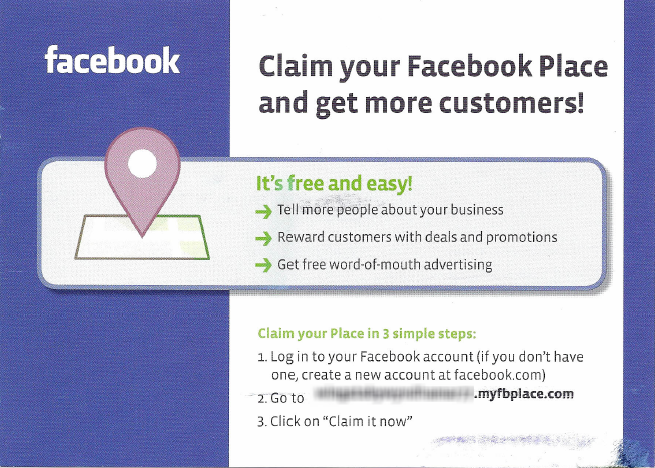 Places pages are one of the latest updates from Facebook, which tie a physical location to a company’s online presence. The goal of Places is to take Facebook’s “Who, What, When” functionality and add the “Where,” by allowing users on mobile devices to share where they are, connect with friends and find local deals. With over 200 million users actively using Facebook’s applications on various mobile devices, claiming and optimizing a Place page is a great way for any business to increase its local presence. A Place page can be created by any individual using Facebook. For this reason, many popular businesses have Place pages that already exist on Facebook, but the owners of the business are completely unaware of the activity on the page. Facebook allows the owner to claim and optimize the page, updating location and contact information, adding a profile photo, offer deals or discounts and more. Since any user can create a Place page for any business, the Place page can have activity on it without being optimized. 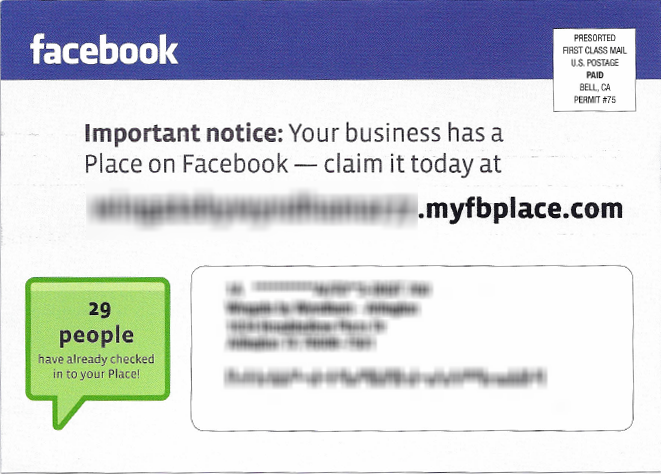 In the example shown above, Facebook sent a postcard using old-fashioned snail mail (gasp) to alert the owner that a Place page was alive with activity – 29 people checking-in to be exact – and give simple instructions on how the business owner can claim the Place page. 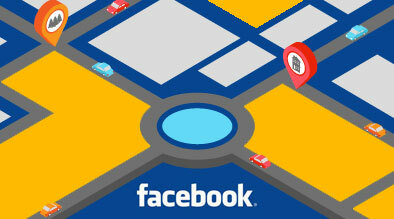 Have you claimed your Facebook Place page yet? Have you had any success with Facebook Deals? Let us know in your comments below!